How Do Girls Keep Their Skin So Clear? Even if you have oily or acne-prone skin, you still need moisturizer. Even when you're young, it is important to keep your skin hydrated. Not only does proper moisturizing help your skin look fresh and soft today, starting a nourishing skincare routine in your teens and twenties can help prevent wrinkles later on. Not only does hydration make your skin look better, it also helps it feel better by preventing tightness and itching. If your skin is dry, it's not enough just to dab on some moisturizer. You need to cleanse and tone with the right products daily. Drink plenty of water, and eat water-rich foods. Aim for at least 2 liters of water a day. Add fresh fruits such as melons, vegetables such as tomatoes, and healthy fats like avocados and olive oil to your diet. Wash your face with a mild, moisturizing cleanser. If you have acne-prone skin, skip the harsh benzoyl-peroxide and salicylic-acid washes and use a soap-free liquid cleanser before applying acne medication. Using lukewarm water, lather for 30 to 60 seconds, and rinse well. You can also wash your skin with a soft brush or washcloth to exfoliate, which will help your skin absorb your moisturizer better. Dab your face with moisturizing toner such as rosewater instead of alcohol-based astringent. Moisturize every time you wash your face, preferably while your skin is still damp -- this will help to lock in hydration. If your skin is very dry, look for a moisturizer rich in natural oils such as shea butter and coconut oil. If your skin is oily, use an oil-free gel moisturizer for hydration without breakouts. 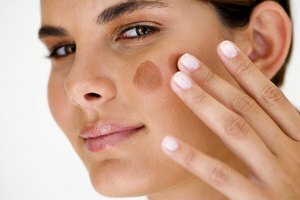 Apply a heavier night cream before going to bed, especially in cold winter months. Look for a cream with ceramide or hyaluronic acid, as these ingredients will help you to retain moisture while you sleep. 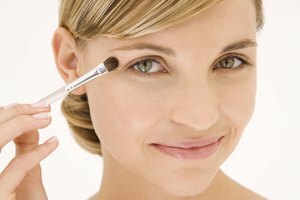 Use a hydrating foundation and powder over your moisturizer if you wear makeup. Look for a formula containing sunscreen to help protect your skin from UVA and UVB rays that can age your face and lead to melanoma. What Happens if You Don't Wash Your Face? Becker, S.R.. "How to Hydrate Your Face." Synonym, https://classroom.synonym.com/hydrate-face-6315.html. Accessed 25 April 2019.